This week, the United Nations Educational, Scientific and Cultural Organization, or UNESCO announced new members to its list of the "Intangible Cultural Heritage of Humanity." The 12 new members included Neapolitan pizza-making, among others. "Congratulations #Italy!" UNESCO said in a tweet after a meeting in Jeju, South Korea. Italy argued the practice of the "pizzaiuolo" was part of the country's cultural tradition. "Pizzaiuolo" relates to preparing and baking pizza in a wood-fired oven. In Rome, pizzeria owner Roman Fiore celebrated the decision. "I am honored, like all Italians and Neapolitans are ... pizza has centuries of history," he said. Neapolitan pizza has a thin crust. The edge of the crust, when baked, grows larger. It looks like a bicycle tire. Perhaps the most famous kind of Neapolitan pizza is called the Margherita. It has tomato, mozzarella, oil, and basil. These ingredients give the pizza red, white, and green colors – the colors of the Italian flag. According to tradition, a local chef created the Margherita in 1889 to honor Queen Margherita. She was visiting Naples, south of Rome on Italy's coast. Some Italians do not like how foreigners have made changes to the traditional pizza. 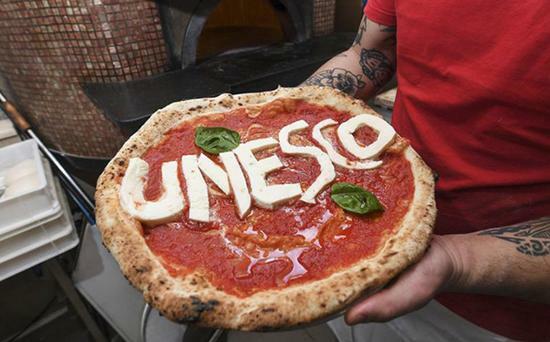 Before UNESCO's announcement, Matteo Martino, a customer at Fiore's pizzeria, said "I think, and I hope, that this could be the chance to make foreigners understand how pizza is made, without Nutella or pineapple." In its list of cultural heritage, UNESCO also accepted Chogan, an Iranian horse riding game, and Nsima, a cooking tradition from Malawi. The existing UNESCO list already includes Turkish coffee culture and tradition, Croatian gingerbread-crafting, and Georgian wine-making. In New Zealand, the Maori people maintain a strong cultural tradition. My friend met with an accident while horse riding. The bicycle tire blew out at a previously damaged point. You can fully experience the Melbourne's coffee culture. 5.Some Italians do not like how foreigners have made changes to the traditional pizza. You have made changes to your hardware settings. Most banks have already made changes to pay structures. 6.According to tradition, a local chef created the Margherita in 1889 to honor Queen Margherita.